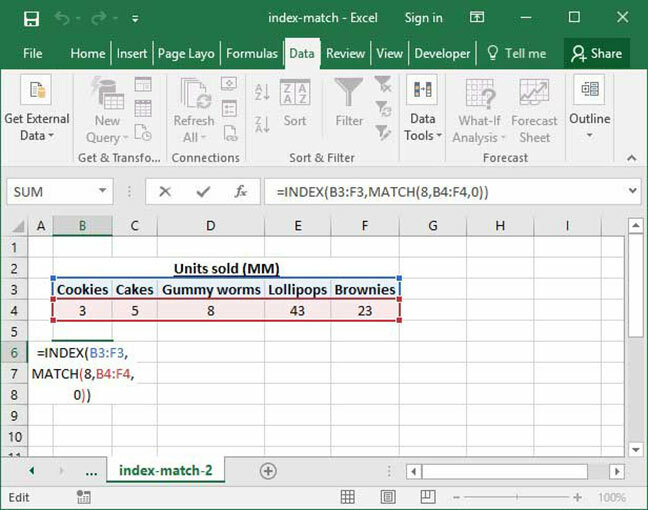 The INDEX MATCH function is one of Excel's most powerful features. 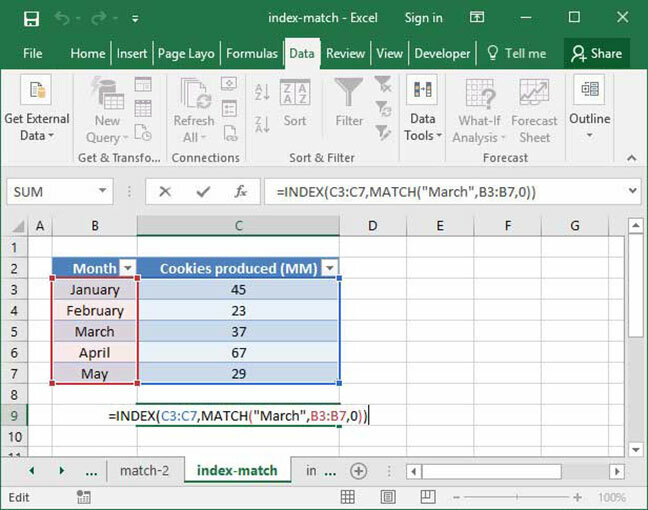 The older brother of the much-used VLOOKUP, INDEX MATCH allows you to look up values in a table based off of other rows and columns. And, unlike VLOOKUP, it can be used on rows, columns, or both at the same time. 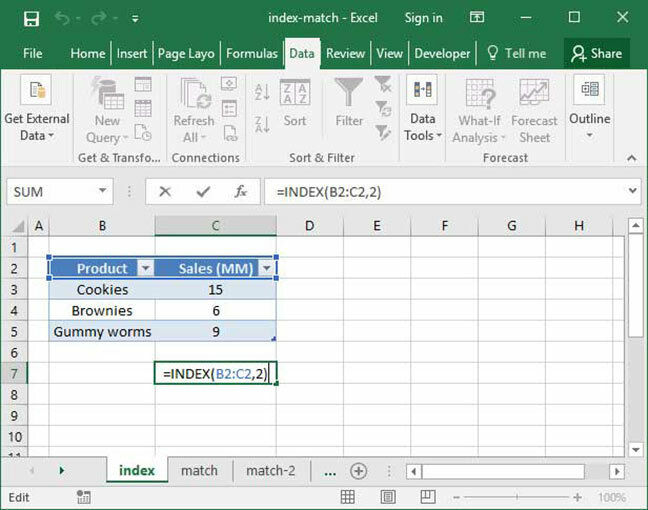 Before we begin, it is important to realize that INDEX MATCH isn't actually a standalone function, but rather a combination of Excel's INDEX and MATCH functions. Read on to find out how to use them together to activate one of the most powerful tools Excel has to offer. In this example, the formula outputs the number 9, because the cell 3 spaces into the specified range contains the number 9. In this example, the formula outputs the number 15, because the cell 1 space into the specified range contains the number 15. As you can see, INDEX works exactly the same way, counting the number of cells we specify in our row_or_column parameter and outputting what it finds at the end of its search. In this case, this is the string "Sales (MM)". This function may not seem particularly useful — and, used alone, it isn't — but when combined with MATCH, it becomes much more powerful. In this example, the formula outputs the number 3, because the value "Cookies" is found 3 spaces into the specified lookup range. That match_type parameter is confusing, but really important to have in your formula. For now, always use a value of 0 for your match_type. In this example, the formula outputs the number 5, because the value "Brownies" is found 5 spaces into the specified horizontal lookup range. Let's take a closer look at what's going on here. First, we call INDEX on a range of numbers from which we would like to look up a given value. 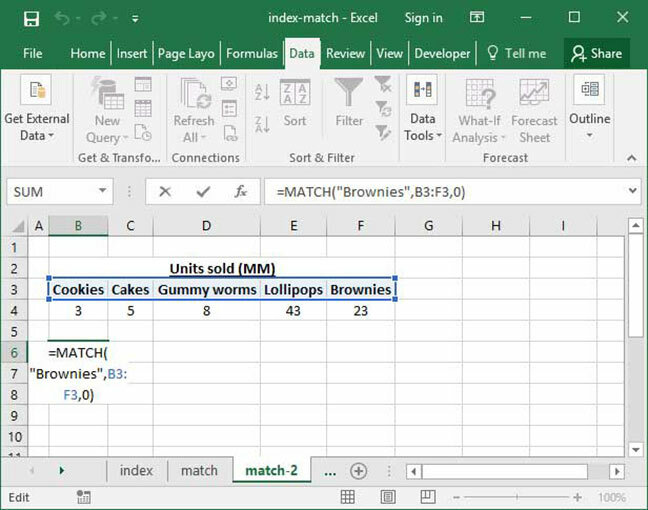 Then, we use MATCH to tell Excel how many cells it should count into INDEX's range, based on a given value matched against a separate array. In the example above, the formula outputs the number 37. Why? First, we perform an INDEX on the Cookies produced column. How does Excel know how many cells to count down within the INDEX? It looks to MATCH, which is called on the Month column. MATCH finds the string given in the formula — "March" — three down on the list, so it pipes the number 3 back into the INDEX function, which counts down three cells and returns 37. In this case, we're using the function on a horizontal range, and we're looking up something in a table header, rather than table data itself. However, INDEX MATCH still works well. You can also use INDEX MATCH with wildcards to look up based on a partial phrase or string. Take a look at our tutorial on wildcards in Excel for more information. After all this, you may be wondering why we even bother using INDEX MATCH. Isn't VLOOKUP just as good? You don't have to count. With INDEX MATCH, there's no more worrying about counting to figure out which column you need to pull from. You just select your lookup column and your results column, and you're done. You can safely insert columns. With VLOOKUP, if you insert a column in between the start of your table and the column you want to reference, your formula will break — the column_index_number within your VLOOKUP won't update. INDEX MATCH, on the other hand, safely updates no matter where you insert columns. You can lookup backwards. VLOOKUP only allows you to look up from columns that are in front of your starting point. Not so with INDEX MATCH — you can pull from any column you want to. Separate formulas. Now you don't need to remember separate formulas for VLOOKUP and HLOOKUP. More complex functionality. INDEX MATCH doesn't stop with the above tutorial. You can also use an INDEX MATCH MATCH to look up across both rows and columns, or use an INDEX MATCH with multiple criteria. Now you know how to use INDEX MATCH! When you're finished reading, be sure to check out our overview of how to use Excel for more useful tools. It gets even better: the INDEX function can be used on a whole table range rather than a single row or column of data. For more information, check out our INDEX MATCH MATCH tutorial.